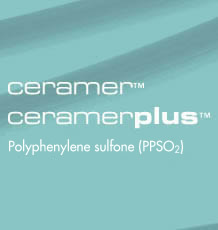 Ceramer and Ceramerplus are sinterable high performance polymers based on polyphenylene sulfone (PPSO2). Ceramer products are applied in areas where excellent thermal stability, inherent flame resistance and universal chemical resistance is required in combination with high hardness and stiffness. As the outstanding organic filler in PTFE compounds Ceramer and Ceramerplus significantly reduce abrasion, wear and creep tendency without affecting the overall temperature and chemical stability of PTFE. and as additive to improve metallization. In addition Ceramer products are use in coating systems through thermal spraying and as consolidated neat resin shapes. Ceramer and Ceramerplus meet the FDA food additive regulations as articles or components of articles intended for repeated use in contact with food.